Saute green pepper and onion in oil in a large skillet until tender. Add garlic; cook 1 minute longer. Transfer to a large bowl; cool to room temperature. Add the eggs, milk, bread, cheese, rosemary, salt and pepper. Crumble beef and pork over mixture and mix well. Pat into two greased 9-in. x 5-in. loaf pans. Combine ketchup, brown sugar and vinegar in a small bowl. Spread over tops. Cover and freeze one meat loaf for up to 3 months. Bake the remaining loaf, uncovered, at 350° for 50-55 minutes until no pink remains and a thermometer reads 160°. Let stand 10 minutes before slicing. 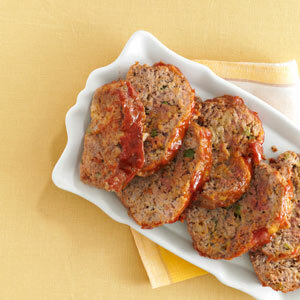 To use frozen meat loaf: Bake frozen meat loaf as directed, increasing time to 1-1/4 to 1-1/2 hours. Yield: 2 loaves (8 servings each).